Maplestone Hall Great Place to Stay! The one bedroom chalet is absolutely fabulous. The host were amazing and very friendly and full of local knowledge if required. The breakfast was outstanding and tailored exactly to how we wanted it. Overall an idilic location and wonderful hosts. Will definitely stay again! We had the most lovely weekend stay with Richard and Michael. They couldn’t have been more attentive hosts.The room was beautifuly designed and very comfortable. We slept extremely well and would highly recommend Maplestone Hall. We stayed here for a 2 day break in October 2018. The whole experience was amazing from start to finish, the room was really beautifully with a very comfortable bed and the bathroom was sparkling with a great shower. The hosts were really friendly and couldn’t do enough for us and had a great amount of local knowledge. The breakfast was great,if we are ever down this way again would definitely be staying here. 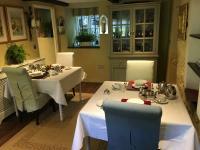 Comfortable, well-appointed room, attentive and friendly hosts, rounded off by an excellent breakfast. Strongly recommended. Interesting and entertaining hosts. Lovely house and room. Lots of choice of food for breakfast.Full marks all round. 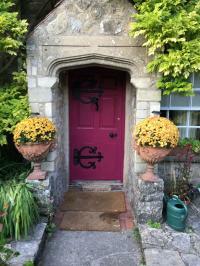 Must be one of the best.Beautiful house and garden.Comfortably furnished.Wonderfully quiet.Generous hosts, who were happy to share their knowledge of the local area.Hope to go back and explore Somerset from the comfort of this outstanding B&B. We were a group of 6 adults staying in 3 rooms for 2 nights. Richard and Mike gave us a very warm and friendly welcome. All the rooms were immaculately presented and the facilities well thought out with a lot of attention to detail. Nothing was too much trouble even down to accompanying us part way to guide us to a restaurant in town for an evening meal. There was an excellent choice of options for breakfast which was of the highest quality and plenty of it. We would highly recommend this to any one. Probably the best b&b we have ever stayed in. Beautiful B &B, on our arrival Richard one of the owners came out to meet us, helped us with our bags. Shown us to our rooms. We were there for a friends Wedding and nothing was to much trouble for Richard or Michael, Richard even rang and booked our Taxis for us. Lovely Breakfast, fresh fruit, Yoghurts and cooked. Definitely stay again. The hall has quite a lot of history, thank you Richard and Michael for a lovely few days stay, so welcoming. Everything was great. Very clean, organised &breakfast was amazing! The spacious room was perfect, very comfortable beds, little extras,such bottled water along with plenty of tea, coffee and lovely biscuits. 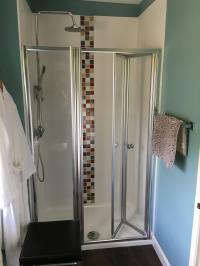 Great shower and beautiful thick towels with nice toiletries. The breakfast was all local produce and cooked to perfection. We can't fault anything about Maplestone Hall and would highly recommend it to anyone. So thank you Michael &Richard for making our stay so memorable. 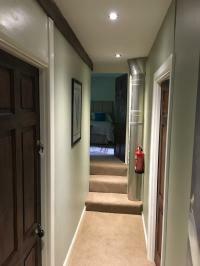 This B&B was perfect for our overnight stay, our first time in Shepton Mallet and we were extremely pleased with the delightful room, very comfortable beds, great shower, thick towels and lovely toiletries. Even the little extras made it very special, so thank you Michael &Richard for our lovely stay. 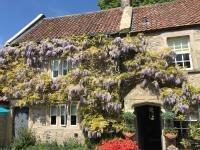 We chose this B&B as Maplestone Hall is only 5 mins walk away from Kilver Court where we were attending a wedding. 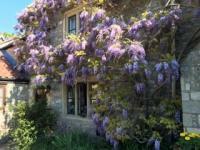 The house and gardenare both delightful and Richard and Michael are excellent hosts, keen to ensure their visitors enjoy a wonderful stay. The rooms are clean, comfortable and tastefully appointed with generous supplies of refreshments. Breakfast was excellent, too. We wouldn't hesitate to recommend this accommodation. Richard and Michael were charming hosts. 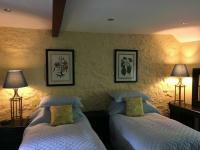 The ensuite twin bedded room was large enough to accommodatef two ladies comfortably. Nothing had been forgotten;from milk and water in the fridge to toothbrush and toothpaste. Full English breakfast with all the trimmings and we didn’t have to cook it or clear up - bliss! Come back? Can’t wait! Thank you Maplestone. We’ve already recommended you and your establishment to Charles Dowding and his No Dig gardening course. Warm welcome from hosts on arrival, great service throughout stay. Beautiful house and attention to detail in guest rooms and bathrooms. Lots of lovely extras such as chocolates and fresh coffee on refreshment tray. Hope to stay again. Continental and English breakfast with quality ingredients. Richard & Michael,Just a short note to tell you how much we enjoyed our 2 nights' stay at your lovely place in Shepton Mallet ! It was much too short ...We really appreciated the great attention to detail and the well decorated rooms.In our bedroom, everything was well thought of:from freshly ground coffee, a nice selection of tea, a lovely range of biscuits, wonderful mint chocolates to tasteful, homegrown apples...Everything was immaculate in the bathroom:lovely, soft and very large bathtowels, bathropes and even slippers and also a nice selection of toiletries. The round shower cubicle was very comfortable to use (plenty of hot water too!) and it was lovely to have a soft shower mat to step onto when coming out of the shower. Plenty of space to put wet towels too!Our freshly cooked breakfast made a very good start of the day! The choice is amazing... I certainly appreciated the bowl of freshly cut fruit and the smooth Greek yoghurt with honey. The freshly brewed coffee was superb ...Your cottage garden is very pretty and attractive. It's a pity we didn't have some more time to enjoy on your little patio (under the parasol !) with a glass of bubbles !The Dusthole pub was a bit of a downside but the meal on the second evening in the family-run restaurant made up for it ...!!! (Thanks for walking us there, Michael!! )Thanks once again for the warm welcome ! We will certainly recommend you to our friends and we will try and come and stay with you again when we are in the area. It's a pity it's too far away from where we live in Belgium to come over for a weekend ... but still if you have any good offers going, please don't hesitate to let us know ! !Congrats with your concept, guys, it is much appreciated ! Keep up the good work ! Maplestone Hall is possibly the best establishment we have stayed in. Superb room well appointed and decorated to a very high standard. The breakfast was outstanding and the owners could not do enough for you. If you need a room in or around Somerset and you do not stay here you are quiet frankly stupid. The cottage was excellent, very, very clean, neat and comfortable. Thanks guys for looking after us, loved your company. 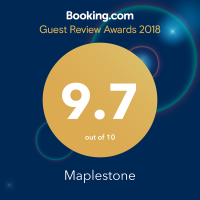 Delightful and extremely well appointed accomodation combined with charming hosts make Maplestone Hall perfect in every way. A beautiful room with fabulous decor and very thoughtful little touches including fresh milk and chocolate mints. A well cooked breakfast and delicious coffee. I will definitely be returning next year. Excellent accommodation and ideal location for town and showground I stayed here for 4 nights. Easy parking and very private. Both hosts made me very welcome, breakfast was excellent and the bed in my room gave me a full nights sleep every night, just what I wanted for my day ahead. We stayed in September 2016 at Somerset in Richard and Michaels hotel. Sooo beautiful! The hotel has a very personal touch and the old and new elements in the design of the house have a special atmosphere. The surrounding garden seems almost enchanted. We have on request a very good vegetarian breakfast and the two have surprised us for dinner with delicious, varied vegetarian dishes accompanied by classical music. Richard and Michael are so attentive and sympathetic hosts. Thanks for that! A very recommendable hotel. We warmly greet Richard and Michael in the United Kingdom.